IT SOUNDS like something dreamed up by the more fanatical and ignorant parts of the English Defence League — a sinister plot by hard-line Muslims to take over a number of schools in the Birmingham area. But the scare, triggered by a single anonymous letter, has shown up the deep contradictions and clashes within the Conservative Party leadership. 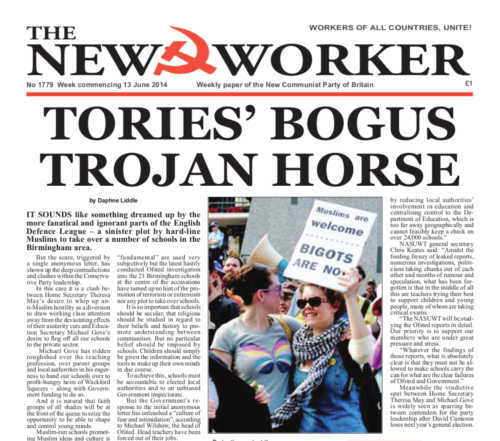 Communists met in central London last weekend to consider the role of the working class in the current crisis and pave the way for a new theoretical journal to take the movement forward. And many took part in the discussions that followed the talks given by comrades from the New Communist Party of Britain and the Revolutionary Communist Party of Britain (ML) that kicked off the discussion around the theme of the Agenda for the Working Class. WHEN is an election not an election? The answer, as always as far as the imperialists are concerned, is whenever the result goes against them. Last week Syrian president Bashar al Assad was re-elected in a landslide victory that confounded his enemies who had hoped the vote would never take place and did their best to disrupt it when it did. Millions of Syrians at home and abroad took part in the election that swept Bashar al Assad to the presidency with 88.7 per cent of the vote. Two challengers garnered just over seven per cent between them and the turn-out was a remarkable 73.42 per cent given that the Nato-backed terror gangs still operate in the east of the country. Meanwhile the American president has been poking his snout into British politics with a direct call to Scots to vote against independence in the forthcoming referendum. Like the Pope announcing his belief in the doctrine of transubstantiation Barack Obama announced: “We obviously have a deep interest in making sure one of the closest allies that we will ever have remains a strong, robust, united and effective partner”, apparently after being asked to do so by Prime Minister David Cameron, at the G7 Conference Brussels last week.